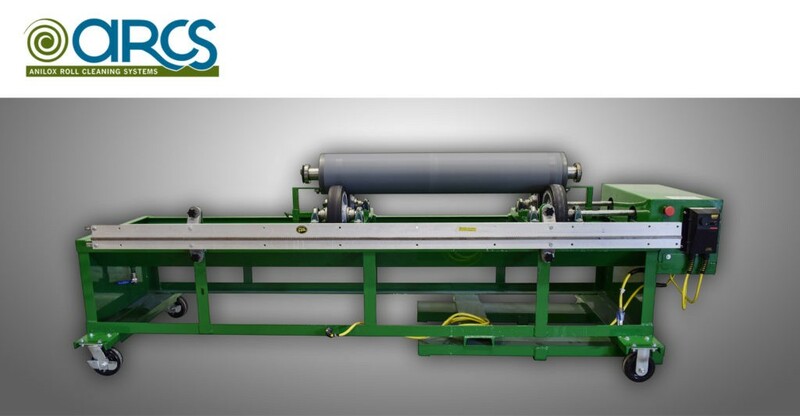 Our 30+ years of roll cleaning industry experience has positioned ARCS as experts in not only the roll cleaning services we provide but also has enabled us to develop a proven Anilox Roll Cleaning System for companies looking to perform roll cleaning on their own. Compact and Portable – the Pro-Series small footprint means it can go virtually anywhere you need it at your plant. 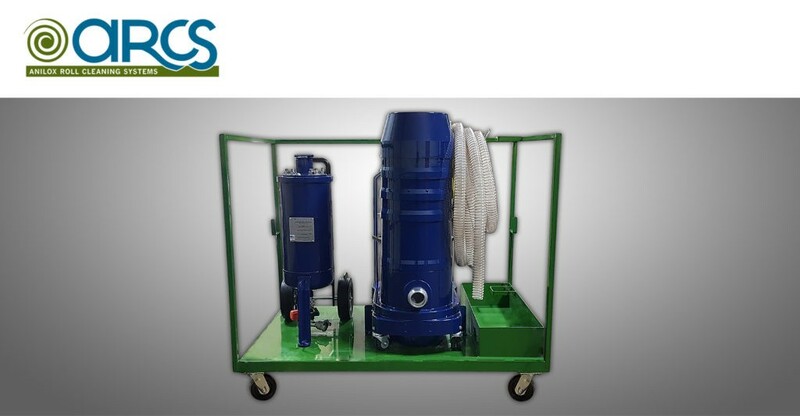 Simple operation – our system only needs one standard electrical circuit and a limited amount of compressed air – it can even connect to your existing quick connect air drops in most cases. Universal Cleaning – for On-Press cleaning, the Pro-Series will work on over 25 different presses and counting! The Pro-Series can remove the most stubborn residues from both low and high line screen rolls AND high and low volume cells. The ARCS Pro-Series can be used for On-Press or Off-Press cleaning. For companies who need the flexibility to clean their anilox rolls both on and off-press, we can configure the system to do both! For companies with large “Jumbo” rollers or rollers which are very difficult to remove from their press, this is a great option that will save many man-hours. 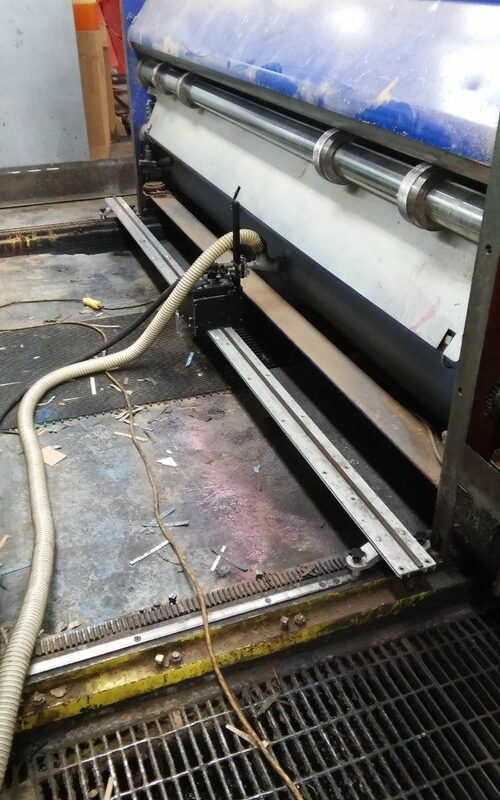 On-Press cleaning also reduces the risk of roll damage occurring – most plants we work with have horror stories about how a roll became damaged due to mishandling. 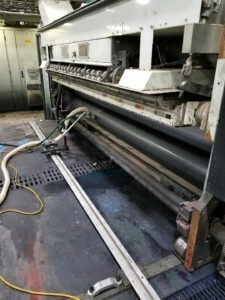 Our On-Press system is universal and can be used on almost any size roll in any type of press. The equipment is highly portable and designed to be used throughout your plant. An Off-Press option available for companies using sleeves or who wish to have one central spot for roll cleaning. 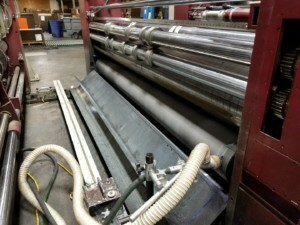 An Off-Press system utilizes a heavy-duty cart that continuously spins the roll as it is getting cleaned. We can also configure a system so that it can perform both ON-Press and OFF-Press cleaning in your plant when required. These systems include everything you need to easily switch from on-press to off-press cleaning. Automated – The traversing speed of the hose and vac nozzle assembly along the track are automated and remains constant throughout the cleaning process and can be adjusted for various roll diameters and lengths. Deep Cleaning – The system operates with compressed air and applies the baking soda along the face of the roll at a low pressure. As the baking soda hits the roll surface, it instantly fractures into a particle size below 8 microns – this means the baking soda reaches all the way to the bottom of the cell, ensuring the entire cell gets cleaned out — not just the cell walls. Portability – Mounted on wheels, our light-weight, simple to use system is designed to move with ease in and around hard-to-access press areas. Easily detachable components allow for even more flexibility. With each system purchase, we include set up and in-plant training. We also provide new operator training upon request, as we understand personnel changes happen from time to time. 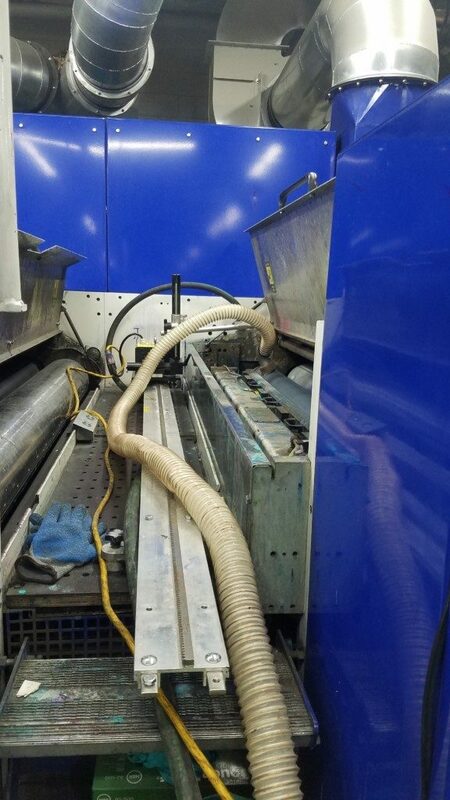 Our factory-trained technicians use this same equipment in the field when we perform our anilox roll cleaning service for customers – our training covers all aspects of system operation and ownership, including operator, maintenance, and troubleshooting. For our international customers requiring CE certified anilox roll cleaning equipment – contact us for an alternate option to meet your needs! Contact us now for further information or to schedule a demonstration. 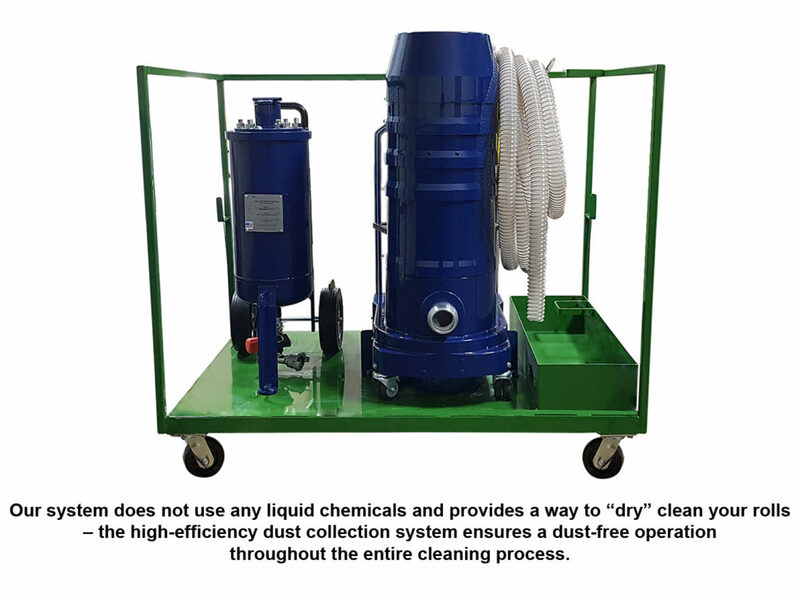 Refurbished Baking Soda Roll Cleaning Systems – Are you ready to purchase an anilox roll cleaning system but are interested in buying a used system instead of a new system? Our refurbished systems run like new and look almost new! Check in with us to see if we have any refurbished on-press or off-press systems available. System Maintenance and Training – Has your plant inherited a used soda system? Or do you have a system that has been “forgotten” and is sitting in a corner of your warehouse? If so, we have a full staff of factory trained service technicians who can handle repair and maintenance requests for virtually any kind of legacy system. We can also perform training sessions and supply spare parts, rebuild kits, nozzles, brush heads, hoses, filters and the specially formulated baking soda that goes into the pot (see Anilox Baking Soda tab above). The Baking Soda we use is a proprietary, engineered formula originally developed by Arm and Hammer that allows for superior yet gentle cleaning, a dust-free application, and is environmentally-friendly. Regular baking soda (like the stuff found in our refrigerators) will not work! Please do not attempt to use it, as it will clog your machine quickly, and will not clean your rollers at all. The particle size of the Anilox formula starts out at about 70 microns. When it “hits” the roller face under low pressure, it instantly fractures into many smaller particles. This is what enables the soda to get to the bottom of the cell – the fractured baking soda gets as small as 7-8 microns. 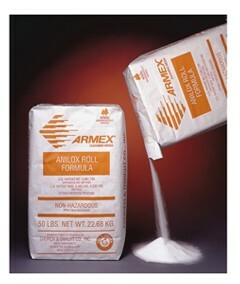 The baking soda that is used to clean anilox rolls has been specifically engineered for this application. 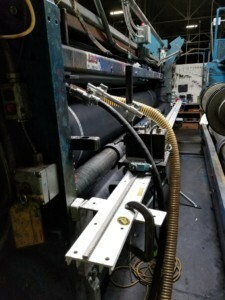 We had a leading anilox roll manufacturer test, analyze and verify that, when using our baking soda, they were successful in cleaning both lower lpi rolls as well as higher line counts as well. Because baking soda is classified as non-hazardous, and because it’s used in a dry process (no rewetting of inks or coatings occurs), any waste generated is usually not subject to any special handling or disposal requirements – check with your local authorities to make sure of this. Call us to learn more or to place an order. We do not have any order minimums, and ship nationwide. Click here for our Shipping and Merchandise Terms and Conditions. Jerry R. "He actually exceeded our expectations as to how fast the process went"
Frankie S. "The roll came in on friday and we tested it. Great job! Thank you for helping us out on this one.As always everything went very well. Mike does a great job: always on time and very professional on the service he performs. Thank you for what you and your team do for our plant."